Jenn Herman is a social media consultant, speaker, and globally recognized Instagram expert. She is the forefront blogger on Instagram marketing and her blog, Jenn’s Trends, has won the title of a Top 10 Social Media Blog in 2014, 2015, and 2016. Through her blog, consulting, and speaking Jenn provides tips, resources, and training for small to medium-sized businesses that need to structure their social media strategies. Her business background includes Administration, Sales, Human Resources, and Marketing and she enjoys bringing all these skills together to help you grow your business. Jenn has been featured in Inc., Yahoo Finance, and numerous other podcasts and publications. She is the author of “The Ultimate Beginner’s Guide to Instagram” and “Stop Guessing: Your Step-by-Step Guide to Creating a Social Media Strategy”. I believe we’ll see a lot more in-app integration for social media in 2017. We’re already seeing Facebook and Instagram find ways to keep people more engaged in the social media app, rather than leaving to visit an external website. I think this trend will expand and continue as social media platforms and businesses find ways to encourage conversation, purchases, and conversions directly on social media. Cognitive Marketing will get a lot of attention in 2017 as artificial intelligence, machine learning, and natural language processing make repetitive and structured marketing tasks much easier to implement and manage. This is way more than just another content fad, but rather it’s online video crossing a crucial threshold… Do you want to know really why I think it’s gonna be huge? Not because I’m using it or Millennials and GenZ are using it… it’s because it’s making video social. Because they’re not just streaming what’s happening live. They’re allowing you to engage with those streams… you are now able to be a part of the conversation. #RonR… #NoLetUp! Pam Didner is a marketing consultant, author, and speaker, whose international book, “Global Content Marketing”, is the first to offer an accessible, comprehensive process to scale content across regions. During her tenure at Intel, she led enterprise product launches and worldwide marketing campaigns as a globally integrated marketing strategist. She now leads a boutique-consulting firm that trains, coaches and provides strategic guidance on audience development, messaging architecture, editorial planning, content creation and media outreach on a global scale. Tim Hughes is a transformational leader, best-selling author, and top 10 Social Media Influencer. With a background in sales and sales management, Tim has been involved in Social Media for over 7 years, having built a following of Twitter of 150,000 and becoming a top 10 influencer. He is an international renown speaker, blogger, and writer. Jamie is an internationally recognized author, speaker and the founder of 60SecondMarketer.com, a marketing blog read by tens of thousands of executives around the globe. He is a regular guest on CNN where he provides insights on branding, marketing, and business. He’s also been profiled in one of the world’s best-selling marketing textbooks. There’s a major shift away from traditional marketing to a new technique called nonlinear marketing. Linear (traditional) marketing interrupts a consumer’s life with advertising that tries to sell them a product. Nonlinear marketing is when the brand develops content and experiences that become part of a consumer’s life. If you look at what Starbucks, Red Bull, and Lego are doing, you’ll understand what nonlinear marketing is — content and experiences that consumers digest and participate in without overtly being sold a product or service. Out with the tweets, in with the streams! ?’ Live-streaming, 360 photos, real-time updates, it will all be about the experience users get from your updates. The video will continue to grow and some predict that 2017 will be the biggest year ever for video. Facebook will continue to be marketer’s choice for advertising but I think Instagram will start to shift some of the budgets. Live-streaming, stories (Instagram/Snapchat) and VR will be the ‘talk of the town’. I correctly predicted that 2016 would see tremendous attrition in social networks. Blab, Meerkat, Tsu and others all faded away or pivoted. Even media darling Twitter is struggling and sought a buyer. I think that the biggest digital marketing trend of 2017 will be video, video and more video. Live streaming has been in constant and very rapid growth this year, in large part due to Facebook, but businesses haven’t made full use of it as of yet. 2017, though, will be different – businesses are starting to understand the power of video, both produced and streamed live, so I think that they will be investing a lot more in this form of content in order to stand out. Nothing new or exciting just a deepening of what’s already been evolving: more data-driven marketing. As technologies advance and vendors consolidate, it will become more accessible to many to create closed-loop marketing tracking, analyze data in a way that makes it very actionable, and then target audiences in a very personalized way. Things like retargeting, custom audiences and the combination of online and off-line will become ubiquitous. Also, we will see the IoT penetrate much more areas of our lives, and hence, marketers will use the data they can now collect for more data-driven marketing (and product improvements). Last but not least, we’ll start to see big changes in how we need to approach SEO. Google is moving into using AI to improve our search experience. This will affect how we as marketers operate to appear in search results. As voice search is taking hold, this will be another huge factor to impact how we conduct SEO. Overall, an exciting year ahead. Keri Jaehnig is the Founder and CMO of Idea Girl Media, an international Social Media Marketing Agency that works with business brands, public figures & select non-profits, providing customized marketing campaigns and social media training. Now the Social Business Faculty Chair at Simplilearn, I am humbled to have received a 2013 Small Business Influencer Honorable Mention Award, and a commendation for Outstanding Attainment in Social Media from the Senate of the State of Ohio. My insight has also been featured in Social Media Today, SteamFeed, Search Engine People, and AOL Small Business, as well as Forbes and Business Insider. Non-fat lattes, travel & quick wit make me smile, and I am always enthused to meet new people! There was a time where quantity sometimes earned greater traction than fewer quality posts on social media. As social media has evolved in the past few months to a year, quality over quantity is the way to go. Also, we can no longer be stubborn – successful online marketers will use social ads. The good news is that video ads are seeing excellent results, and video is super social! LIVE video will continue to become more popular, Instagram has even flexed to offer this feature via Stories. 1.Measurement: In today’s digital era, measurement is becoming increasingly important. So much so, those who have figured out how and what to measure effectively outshine their competitors. In 2017, the digital marketer MUST move beyond vanity metrics and measure that which drives real business results. The data is out there. You just have to find it and use it. 2. Artificial intelligence: A few years ago, I was introduced to Narrative Science, a company in my hometown of Chicago that ”writes” stories for publications using robots. At the time, I was appalled. After all, I’m a writer, author, blogger. The idea that I could so very easily be replaced is scary. Because it scared me so much, I wanted to dig in and better understand what they do. It turns out, they can write stories about things such as earnings reports and Little League baseball games—stories where the stats are more important than storytelling. That made me feel a bit better. And now I’m obsessed with artificial intelligence and how it might affect the role of the digital marketer in the next five to 10 years. 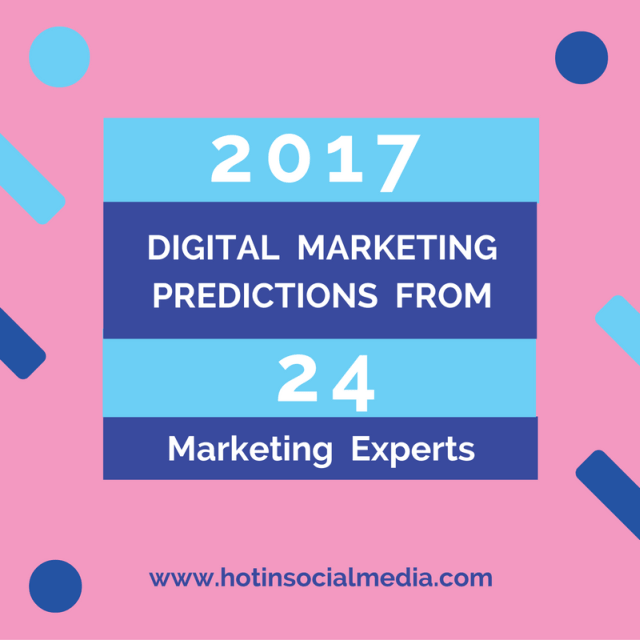 While it won’t change the role of the digital marketer in 2017, it is something we all need to be aware of and plan to embrace. It’s coming and we can’t stop it! 3. Professional development: For several years now, digital marketing has been operating in the wild, wild west. But it’s time to grow up and do things differently and with more sophistication. To do that, we need to learn how to measure effectively, how to implement new trends, and how to figure out how AI and virtual reality and video all affect our roles. The best way to do that is through our own professional development, which is plentiful on the web. You can do everything from reading blogs and teaching yourself to take online courses or buying and reading books. I predict more businesses will utilize Live Streaming Video to connect and engage with their customers in 2017. We’ll also see a rise in automated messaging bots that will assist social media managers in fielding and responding to commonly asked questions. The most popular social networks will also continue focusing on creating native content or contracting content creators to produce network-specific content to keep more users on their site. I predict social media will become even more visual. Text-only posts will fall more out of fashion, and images and videos will continue to gain popularity and audience engagement. It will also be interesting to see what effects if any, Google’s upcoming SEO changes will have on social media marketing. It was announced earlier in the year that effective January 10th, 2017, websites with pop-up ads will have their rankings affected (read: lowered) by Google’s algorithm. Folks that have used pop-ups to sell their own goods will need to make up the incremental income from those sales; folks that sold pop-ups on their sites to sell others’ good will need to make up that ad income. I see a potential for that to come in the form of sponsored social media posts on pretty much any social media outlet, as long as the targeting/audience and tracking/reporting are there. Employees will play an even bigger role in being ambassadors for their brands online. Keep an eye on initiatives such as employee advocacy programs and tools to utilize them for your business. Britt is a writer, producer, and entrepreneur She likes the excitement and creativity that comes with working on new projects. In addition to consulting for tech companies and television networks in the areas of social strategy and implementation, Britt has appeared on the red carpet as a social media correspondent for the Insider and Entertainment Tonight at events for Vanity Fair, the Daytime Emmys, and the Billboard Awards. The noise continues to get louder online, so digital marketers will need to get creative with offline integrations if they want to build lasting relationships. Consumers are moving away from platforms like Facebook for a variety of reasons, so brands (especially those looking to reach younger demographics) will reduce their ad spend and content creation on this platform. Instagram, Snapchat, and YouTube will continue to dominate, but again the offline branded experience integrations will be increasingly effective. I think marketing budgets will continue to move away from paid advertising methods and more towards inbound marketing activities. As the understanding, technology, and technique of content marketing continue to develop, ROI will become easier to evaluate an attribute. I think that the various social media platforms are going to continue to become more and more alike. Soon we won’t be able to differentiate between them all and the “winners” will be the ones with the biggest audience and the highest engagement. I also think that content will continue to be king as platforms look to increase the amount of high-quality content that they are feeding their audience. Last, I think slowly we are going to see an increase in m-commerce as platforms integrate 360-degree views and VR/AR to make trying things on easier as well simplifying the purchasing process itself. Niche focus is going to become a more important element for brands in 2017. Traditionally, broadcasting as far and wide as possible has been the key to marketing success – and broadcasting is still relevant in the modern outreach process. But the ability to hone in on very specific audiences on social, with hyper-targeted messaging, means that it’s often more effective to narrow down your approach, crafting your message to appeal to smaller interest groups and on a unique behavior. The ability to tap into social media data to refine your targeting is really only just starting to catch on, and as we move forward, you’re going to see more brands utilizing this to greater effect. When you segment your audience, you can now also narrow down their specific behaviors, and the relevance of your products to those smaller groups. Creating messages that appeal to fewer people, but relate more closely to hear individual experiences, can be a much more effective tactic. Short-form videos are going to dominate the market as well as marketing specifically on mobile. Brands are going to start using mobile applications for marketing as what China is doing with WeChat the past 3 years. Also, the focus on location-bound marketing is going skyrocket by local businesses. Personalized “QUALITY” content marketing. There’s a lot of content already out there and that’s only going to increase in 2017. The problem is most businesses still don’t have a documented content strategy and as a result, are spewing “CRAP” ad nauseam onto the web. The other thing digital marketers should pay more attention to in 2017 is the personalization of messaging. A relevant personalized message is much more likely to attract attention. “The right message to the right audience at the right time.” Words for digital marketers to live by. Employee advocacy is going to be one of the largest trends of 2017. Companies are realizing the value of their employees’ voices, and how they can be a resourceful way to raise brand awareness and increase peer-to-peer recommendations. It will especially be a great way for brands that are having their budgets cut to tap into content that already exists through their employees. Vladimir Gendelman is the founder and CEO of CompanyFolders, an innovative presentation folder company that has won multiple awards, including ranking in Inc. 5000’s list of fastest-growing private companies in America in 2015 and 2016. He is a thought leader in the print design and has published numerous articles including such publications as Forbes and Times. I think email will play a larger role as one of the digital market trends of 2017. It allows a level of control that social media doesn’t. Large companies can project larger amounts of content aimed in a specific direction compared to social media where followers can create rabbit trail conversations that distract from the content. In addition, companies will spend more time on blog posts on hosting communities to expand their audiences without depending only on social media.